Cambodians show the result of what they claim is bombing by American planes. Prince Sihanouk says Cambodia will release 11 American soldiers when alleged American bombing of Cambodia stops. Their supply boat strayed into Cambodian waters while after Vietcong using the border as sanctuary. _-_ Reporter narration open as summarized, with rocket crater hole and US fragments before him. Prey Tuol village, one mile from the Cambodian border. Describes two US planes flying overhead, heard Cambodian gunfire. _-_ Cambodian army Major Im Chhop Deth interviewed, and says "Tell the truth there are some VC, but villagers report it to them to get them out." _-_ Damaged village thatched hut. Rocket hole, rocket remains. US plane passes overhead, guns heard, bomber later passes over same. _-_ Close up of Prince Sihanouk. On release of prisoners when killings of Cambodians (300 claimed) are stopped by bombings. "We are not involved in war." "It's your war." _-_ _-_ This item consists of raw, unpackaged, news materials relating to the US bombing of Cambodia. 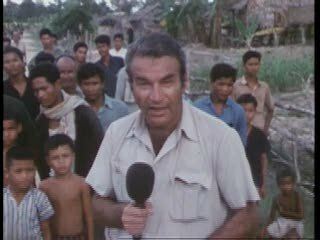 Chicago: “Vietnam: A Television History; Cambodia and Laos; US Violates Cambodia Border,” 11/12/1968, WGBH Media Library & Archives, accessed April 20, 2019, http://openvault.wgbh.org/catalog/V_12A0D0FC75114B33B66A9A55025D148A. MLA: “Vietnam: A Television History; Cambodia and Laos; US Violates Cambodia Border.” 11/12/1968. WGBH Media Library & Archives. Web. April 20, 2019. <http://openvault.wgbh.org/catalog/V_12A0D0FC75114B33B66A9A55025D148A>.